Rumors were flying back in June that the Super Kmart in Virginia Beach, VA was converting to a regular Kmart. That rumor was confirmed to be true in July on the ShopYourWay website. On August 17th 2013, I confirmed it for myself, its no longer a Super Kmart. The "Super" was painted over on the road signs, and the "Super Center"was removed from the facade. Before you go in, they tell you what has been removed to from the store, as well was what they still offer. Inside, the Super K logo is still on the cart as well as over the entranceway. You wont notice much if you walk into the right side, but the left side has changed. Gone are the refrigeration units, the produce section, and the familiar signs showing you fresh produce. The isle markers are still intact, but signs removed from the isles of food thats no longer offered. A temporary wall divides you and the old deli section. Openings allowed me to get some shots of the area. "Employees Only" says the sign hanging up, with employees coming and going as product is still on the other side, possibly for storage. Many floor tiles are missing from when they had refrigeration units mounted into the floor. It was clear it wasnt long since this occurred and the store is still undergoing a transformation to a regular Kmart. This was my 3rd time at this store. I first went in July of 2011. It was 24 hours and it was a real treat. I knew it was something special and took a lot of photos. I went back June of 2012, and it was no longer 24 hours, but business was still booming despite Target being next door. This was one of the "newer" Super Kmart's, so there was no full service restaurant inside or auto center. I was worried, as this was one of a 2 Super Kmarts in the south and less then 6 were on the east coast. I knew it was on borrowed time as supplying this store had to cost a few bucks, seeing no other Super Kmarts were in the area, though this area is flooded with regular Kmarts. The "Hampton Roads" region use to be a haven for Super Kmart. You can find all of those photos on our Facebook page. In closing, as of this posting, this Kmart is "Super" no more. I hope that it will get a new logo, some new paint, remodeled bathrooms and some new decor inside. If you live in the area and can keep tabs on this location, please email us at deadanddyingretail@gmail.com or visit us on facebook!! Well we can consider this a dying retail pretty soon then. If the grocery is gone, no one will go. The Super K's are hanging on by a thread, but the Big K and regular Kmarts are quickly vanishing from the entire country. "We're building a better us for you" - I think getting rid of the grocery side isn't making this store any better. Expanding the grocery departments and offering more fresh options in more stores would be making Kmart better. That worked well for Target and Walmart. Kmart had the right idea back in 2002 when they were going Super K crazy - if only more were still left. Fresh food/groceries is where a lot of profit is. This store looked much nicer as a Super K. I always thought this store was one of Kmart's better performing locations. SHC/Seritage Realty Trust has this location listed as an available location. It's unclear exactly what that means, but it's quite possible that SHC is open to redeveloping the whole property or at least a part of it. Perhaps SHC will keep this location as a regular Kmart for the time being until someone else wants to do something with it should that ever happen. This question may have an obvious answer, but we have not had Kmarts of any kind here in this area since 2002 so I don't know the answer. Have any of the regular Kmarts added/expanded fresh and frozen food offerings kind of like Target has done with their stores? I know that Kmarts have those odd fridges with milk, eggs, and maybe a few other staples, but have they ever moved to add more beyond that? The reason I ask is because I still get SYWR coupons for fresh and frozen food at Kmart. Perhaps the fact that they are still doing national promotions for food products is a positive sign regarding the future of Super Kmarts, but I think we've all heard the Internet rumors that Super Kmarts are going away soon. Perhaps these promotions would make more sense if more Kmarts had fresh and frozen food, but I really don't know if they do or not these days. Of course, a Kmart coupon of any kind is kind of useless for people like me who live in areas where Kmarts no longer exist. The grocery game is notoriously difficult even for established national grocery powerhouses. Competent powerhouses like Kroger have had to retreat from some markets due to the stiff competition. Unlike discount stores, it seems like independent and regional grocers are still strong in many communities. Even Target has been very judicious in opening Super Target locations and seems content to expand their grocery options mostly through regular format stores. If competent retail powerhouses find the grocery game to be challenging, the chances of a malaised or flat out incompetent retailer finding success in the national grocery game are remote. Kmart lists a lot of Super Kmarts for lease/sale as it wants to lease out the extra space up front, old auto centers, etc.... This store has room up front for a small business to go into. Kmart has NOT added anything new food wise since the "pantry" additions of the Big K era. So every Kmart basically has the same selection of items (some might have a bit more then others). The grocery business is more tighter then ever and profits arent as big anymore. People have choices. When American Fare debuted in the late 80s it didnt catch on quick. People didnt get the point of a "hypermart". Even Wal0Mart did its Hypermart stores, which didnt catch on as they would of liked. Once Super Kmart took over the American Fare business, it still was treading lightly in the mid 90s. Kmart saw the potential in the late 90s, building new stores to be expanded later for Super Kmarts and also building smaller footprint Super Kmarts. Ofcourse, 2002/2003, that all changed. Thanks for the information about the "pantry" departments at today's regular Kmart stores. We've certainly had a lot of interesting discount store-grocery store crossovers here in Houston in the last couple of decades. We have the obvious stuff like Wal-Mart Supercenter and Super Targets and we used to have some Super Kmarts. France's Auchan opened a couple of massive true hypermarkets here, but they are gone now. Kroger has recently started to open Kroger Marketplace stores that have expanded general merchandise departments with stuff like furniture. Powerful regional grocery chain H-E-B is doing the same thing with their H-E-B Plus stores. Wal-Mart also has a few standalone Neighborhood Market grocery stores here including the Supermercado de Walmart concept store that is aimed at the Hispanic population (Wal-Mart also opened a Hispanic oriented warehouse club concept store here called Mas Club that is similar to but different from Sam's Club). I wonder if Kmart ever considered stand-alone grocery stores back when Super Kmarts were still a big part of their business plan. I wonder if Seritage's plans are different from the normal in-store leasing and demised space leasing that SHC Realty has done in the past. For one thing, the Seritage brochure for this property states that there are 137,257 sq. ft. of gross leasable space and the graphics don't really indicate that the leasable space is limited to certain parts of the building. I do wonder if Seritage and SHC are floating around the idea of doing some serious redevelopment of this property to the point that they may close the Kmart entirely (or partially) to fit in other major retailers. Seritage is a new division of SHC and perhaps they feel that they can make more money from their properties by leasing them out to other retailers instead of using them for their own stores. I'm sure that nothing is concrete at the moment so the store will probably continue to operate as is for a while at least, but they may be soliciting offers for redevelopment in the hopes that someone will knock their socks off. It's hard to say what Seritage's impact will be on SHC's core retail businesses since it is a fairly new division. Ultimately, you might be right that the only things that end up getting leased out are spots like the old auto center and stuff like that. Id love to know more about this "Mas Club". Any photos? Have you gone into one? Also, they have another concept called Supermercado De Walmart? So basically, one concept regular Wal-Mart and one concept Sams Club? Umm.... 137k sq ft is a lot of space. Thats probably the space Kmart uses minus say, the Sears Outlet taking up a old grocery space, or a current Kmart that has grocery. I bet if they find a buyer for the grocery space, they will sell. I have not been to Mas Club because they do not accept Sam's Club memberships. Mas Club has their own independent membership. That said, I have read about the place and I did come across some photos of the inside and outside of the place on Flickr. Hopefully those pictures will give you a pretty good idea about the place. The photographer who took those is interested in produce photos so that is what most of the pictures are of, but I think you can get a good idea about the store. They do sell other things like electronics and dry goods. The store does look kind of like a farmer's market though and it is smaller than a Sam's Club. Wikipedia has a pretty good write up about the place. I would not say that Supermercado de Walmart is a concept regular Wal-Mart. It's more along the lines of a Wal-Mart Neighborhood Market store. I'm not sure if you are familiar with those as I don't think they are very numerous, but we do have a few in Houston. They are basically Wal-Mart grocery stores without the general merchandise discount store. Unlike a regular Wal-Mart Supercenter that has the grocery department laid out in a vertical type rectangle section, Neighborhood Market stores are laid out in a horizontal rectangular way similar to a regular grocery store. The departments look like those in a regular grocery store as well. I have been to the Houston Supermercado de Walmart store once (I believe there is one in Phoenix as well). The produce and meat sections are larger than what you would find at a Walmart Supercenter or Neighborhood Market. Like Mas Club, they sell a lot of Hispanic-oriented foods that you would not find at a regular Wal-Mart like special types of peppers, Hispanic pastries, and beef tongue. I'm having a harder time finding photos of this store, but Wikipedia has one of the outside of the store (as you can tell, it's not as big as a regular Wal-Mart) and there are some photos of inside the place on Yelp. As far as I know, there really aren't a lot of historical photos or videos of the former Houston Auchan Hypermarkets from when they were open, but they were beastly stores that almost makes a Wal-Mart Supercenter feel like a Walgreens. This was especially true of the West Beltway 8 store that lasted around 15 years. Perhaps American Fare and Hypermarket USA stores felt the same way. You would love it if you ever saw it, but all I can find of this place is this old commercial that only offers a few glimpses of the place. I know that you and many of your readers probably have a keen interest in Kmarts. With that in mind, both the Mas Club and Supermercado de Walmart locations in Houston are near former Kmart locations that may be of photographic interest if you ever visit those Walmart concepts. The former Kmart store #4017, an original 1962 Kmart, is very close to the Supermercado de Walmart on Long Point Rd and near Wirt Rd. The store was turned into a flea market, but it may be vacant now. More information and photos of this site can be seen here. The Mas Club is actually near two former Kmarts. 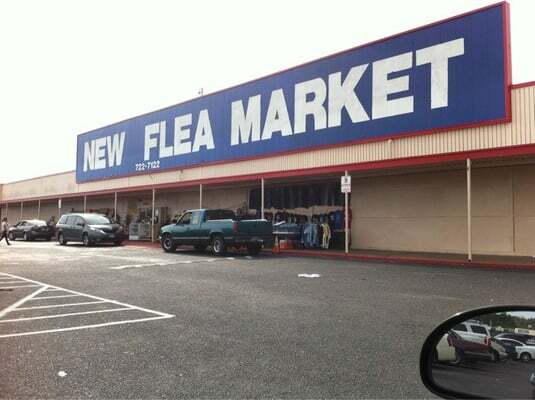 The older of the two, near I-45 and Little York, was turned into this hilarious now vacant flea market that I have shared pictures of here before. That Kmart was replaced by a Kmart (and I believe also Kmart's Builders Square II and Pace club) on I-45 and West Rd. All of those are gone now and now unrecognizable as they have been subdivided and replaced by other successful retailers. The most notable replacement is the very popular Fry's Electronics store that is in what used to be the Builders Square II. We have not had Kmarts in Houston since 2002 (well, I guess the stores technically closed in 2003) and I do miss them especially given Kmart's history here that dates back to 1962. Something that made me pretty excited this past week was seeing photos of an Alco discount store that opened up in a subdivided old Kmart location in the Houston area. Alco kept some signature Kmart features like the big HVAC vents and the strip lights. Also, Alco's signage looks pretty similar to the newish red Kmart department signage. So while we don't have any Kmarts here, we do have a discount store that kind of sort of feels like a vintage Kmart. As far as the Virginia Beach store goes, it's possible that the 137k sq. ft. represents the whole building. The SHC Realty website seemingly confirms that unless there is part of the building that is not currently owned by SHC. I think SHC would be more than willing to lease out the old grocery section to another retailer, but they may be willing to lease out the whole store (and thus close the Kmart) if someone made them a juicy enough offer. Granted, that may never happen, but I guess what SHC and Seritage is open to offers on that. I don't fully understand SHC's intentions and goals with their new Seritage division, but I'm thinking that it may have something to do with Sears wanting to redevelop and lease out existing real estate in potentially "hot" areas instead of selling those properties to other developers like they have been doing in recent years. For example, instead of selling a Sears or Kmart to someone who intends to rebuild the property into a shopping center with a Whole Foods and a Petco, SHC may now want to redevelop that store themselves and lease that space out to Whole Foods and Petco. I'm sure they'd be willing to consider something like turning a Super Kmart into a regular Kmart and a Petco as well for example. I may be totally off-base on this though, but that is my read on the situation. Hopefully one of your readers can inform us better on the topic. Sears had a division at one point that developed properties (Homart) so this wouldn't be the first time they were in that part of the business. Yes, you're definitely right about Sears' history of developing properties through their former Homart division. Homart had quite a history locally here in Houston. Sears/Homart developed the three "Brook" malls in Houston (Baybrook, Willowbrook, and Deerbrook Malls) and co-developed The Woodlands Mall. All four of these malls are very successful today (all four of them are now GGP malls). In fact, they are amongst the strongest malls in the Houston area. Sears recently sold their The Woodlands Mall location to GGP so GGP could open a Nordstrom store that opened a few months back. I suppose that is one situation where Sears was willing to sell off a likely successful location for what was probably a big check. Baybrook is currently building a large outdoor lifestyle center type extension of the mall. The Baybrook Sears is one of the nicest Sears that I have seen and it is one of the few Sears that I know of nationally that has signage with the current Sears logo. Anyway, I don't know if Homart was as successful elsewhere as they were in Houston. I do know they had other successful developments though. Hopefully Sears can develop Seritage into an equally successful operation. It might make sense for Sears to subdivide some Sears/Kmart locations in order to bring more shopping traffic to those locations. I probably should provide some updates to the list of Houston retail sites worth visiting that I wrote here in August 2013 because some of those landmarks no longer exist. Wal-Mart closed the Mas Club earlier this year. As far as I know, the Supermercado de Walmart still exists though, but I have not been by it recently to confirm that. The Pasadena Alco in the former Kmart location also closed earlier this year. All Alco stores are in the process of closing now so I guess that isn't a big surprise. Finally, the interesting looking former billboard style facade Kmart at I-45 and Little York was demolished a few months ago. In fact, a number of interesting old Houston retail sites have been demolished in 2014 or will be demolished soon like the I-45 and Airtex former Buyer's Market Mall/Garden Ridge and the Palm Center Montgomery Ward. There's still a lot of interesting odd/special/vintage/dead and dying retail to see in Houston, but the list of things to see is constantly changing. Sears Holdings, the parent company of KMart needs to pay attention to what Walmart is doing. At the least they should copy Walmart, or if possible improve on what they seem to be doing right. By doing so, more customers would return and KMart could stage a comeback. I felt that the Super KMarts were a step in the right direction since people like being able to do all of their shopping in one place. They are making a mistake by closing them. It's weird how the "Super" part of the sign was painted out. It would have made more sence just to update to the current logo on the sign so it doesn't look so weird and lazy. Nearby where I live, the Kmart in Lebanon, New Hampshire still has the "Big Kmart" logo on the sign. However, the logo on the building is the current logo. The "Big" Kmart in Lebanon is doing fine for now, but the one in Claremont, New Hampshire will probably be dead soon. The former Super Kmart on N. Military Hwy in Norfolk VA is now just a Kmart. Canned and packaged foods remain but a Sears Outlet occupies most of the old restaurant and fresh food areas. The garden center was replaced by a Dollar Tree. It still has over a dozen checkouts but usually only one or two are open. Thanks for sharing! Your post on the store is really good. It is sad to see Kmart leave an area where they have had a store since 1962. Yes, especially one in what had long been their home market right up until the Sears merger and relocation to suburban Chicago. Our web site makes it simple for consumers to start out depending on their own for the dream home they are checking out. you'll have access to seem for homes through out Virginia area and various areas of Rhyan oscine bird. we've a bent to even have a choose style of featured homes that our own team wear within the market. This Kmart is closing. No other VA Beach Km art's are scheduled to close, but this former SuperK is going a sad goodbye. Yeah i've seen that in the news. A going out of business sale will occur and then close completly. There are 979 Kmart stores left with 6 Super Kmarts in operation. It dropped. There used to be 1000+ and 2,114 before the bankruptcy. Im thinking Kmart and Sears will go out of business in the future if they don't separate or invest money. This K Mart is no more period. If I'm not mistaken this is the one on First Colonial road in Va Beach which is right across from the Target I work at. This store was never popular. Rumor has it that its becoming a wal mart.